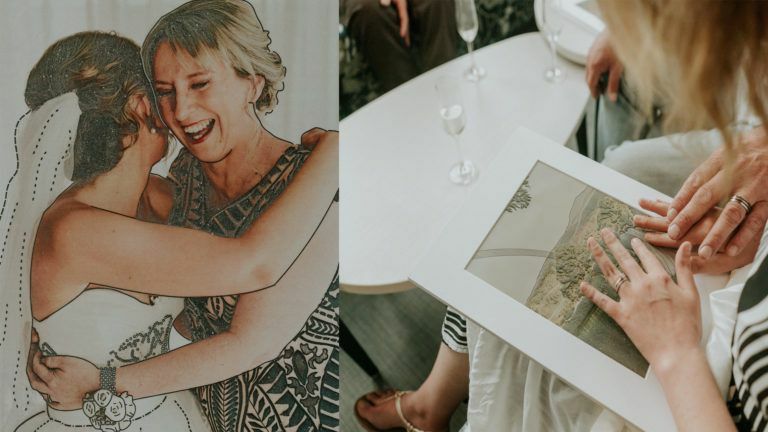 A photographer and videographer over in Australia recently teamed up to create a special tactile wedding photo album for their blind bride. Photographer James Day and videographers Shaun and TJ of Lemon Tree Film House shot the wedding of a couple named Steph and Rob. Unfortunately, Steph is completely blind, but James had a special multi-sensory album made for her so she can remember her big day. Steph has a condition called Cone Rod Dystrophy. It’s an inherited eye disorder that progressed until she became completely blind shortly before she first met her future husband, Rob. Her mother Linda is also blind, so the multi-sensory wedding album meant a lot to her as well. To create a wedding video Steph could cherish, Lemon Tree Film House worked to capture as much audio and narrative on the wedding day as possible. The day after the wedding, James, Shaun, and TJ created a short clip about the wedding. They showed it to the guests, but everyone was wearing blindfolds while listening to Steph’s and Rob’s vows. This way, the guests could have experienced the event from Steph’s perspective. Day’s gift to the couple were textured prints by Vision Australia and a tactile wedding album. The tactile album was something that took months to build, and it caters to nearly all the human senses: smell, touch, sound, and sight. Inside the album are the 10 pieces of fabric along with 10 bottles containing the essential oils that were used. The moments they helped capture were carefully matched with photos and audio snippets by Day, allowing the couple to both remember their favorite moments together while enjoying the book. How do you photograph a wedding where the bride has absolutely no eyesight?For 12 months I pondered this idea. What can I do that will help take them back to one of the most incredible moments of their life?I played through the day in my mind 1000 times. I thought of all the moments where I could potentially rob Steph of having a real moment because of a photo needing to be taken.I stripped back what I did to the core. I reminded myself that ultimately, it's my job to remind people of the love that exists in their life, sometimes that happens by handing someone a photograph and sometimes it happens in another way entirely.I spoke to my friend Jesh from Superfeel who’s help I enlisted to refine the idea I had. Superfeel’s purpose is about helping people experience more joy. You should check them out. I could go on, but this short video explains what we did for her better than any of my words ever could.A massive thank you to Lemon Tree Film House for documenting the entire process, Vision Art — Fine Art Books for creating something incredibly unique and to Vision Australia for helping me turn my images into something that Steph could enjoy.Thank you to Sony Australia for having my back. Your support made this all possible. Most importantly, thank you to Steph & Rob, for letting us tell your story. It's a story that the whole world needs to hear.I asked Steph on her wedding day, "Steph, what's something that you wish Sighted people could learn from what you've seen since you can no longer see.Steph replied, "I wish sighted people could learn to be more appreciative for what they've got. I think so many people take things for granted, like sight for instance. Even though I don't have sight, I'm not breakable, I'm not made of glass and that you can overcome any adversity." Опубликовано James Day Photography Понедельник, 7 января 2019 г. The creatives say the experience of getting to know Steph and shooting her wedding has changed their outlook on life. “Though we can’t give Steph back her sight, she’s absolutely opened our own eyes and made us see more clearly just how lucky we are,” Shaun and TJ state.